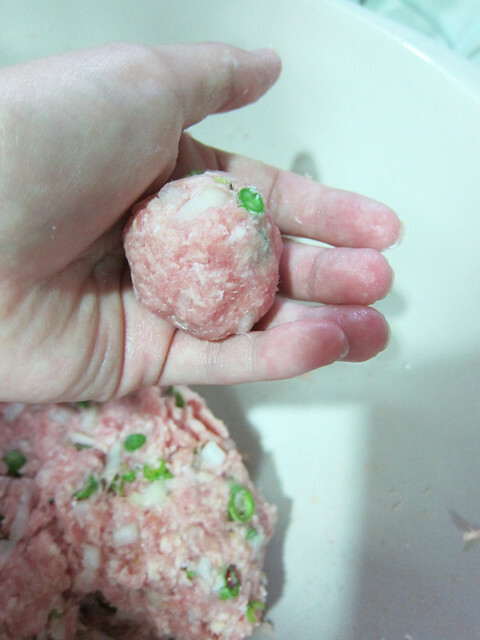 This is actually quite similar to my first pork meatball attempt. However, I ommited the chillies and added something else…cheese! 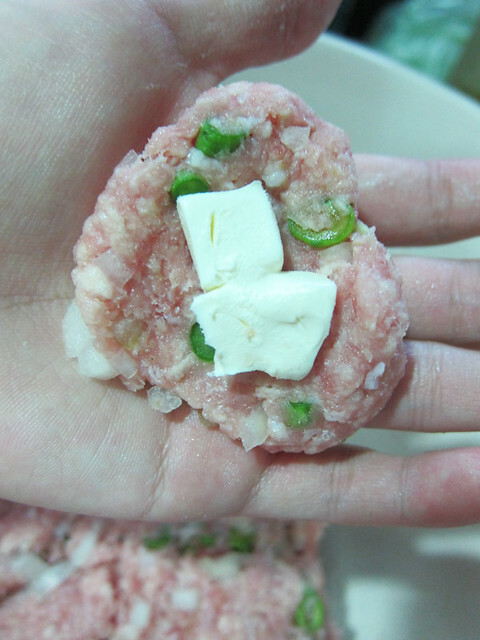 Specifically, cream cheese which I had cut into cubes and stuffed into the middle of the meatball. It was awesome!!! I wasn’t really into cheese stuffed meatballs at restaurants because they tend to use gooey cheese which you could hardly taste after cooking. 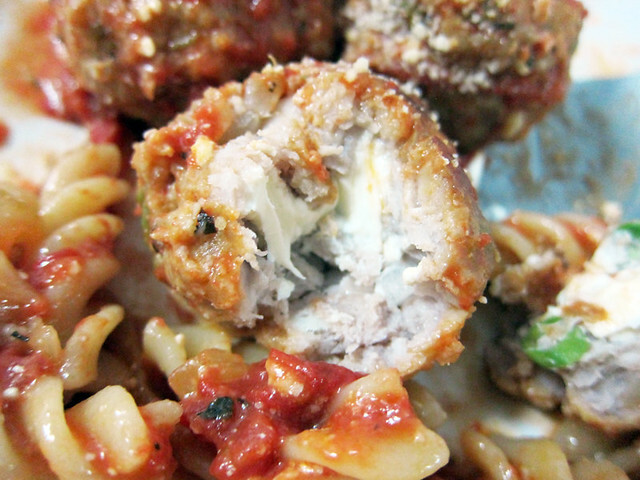 Cream cheese holds it form very well though, and gave the meatballs a nice, interesting, creamy texture. 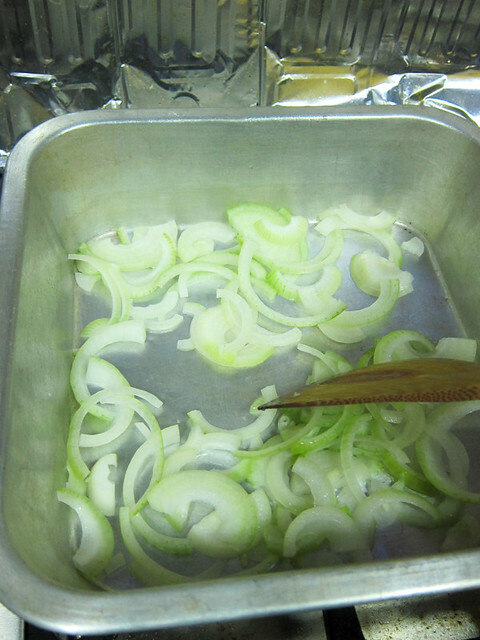 # – First, throw the diced onion and long beans in a bowl. 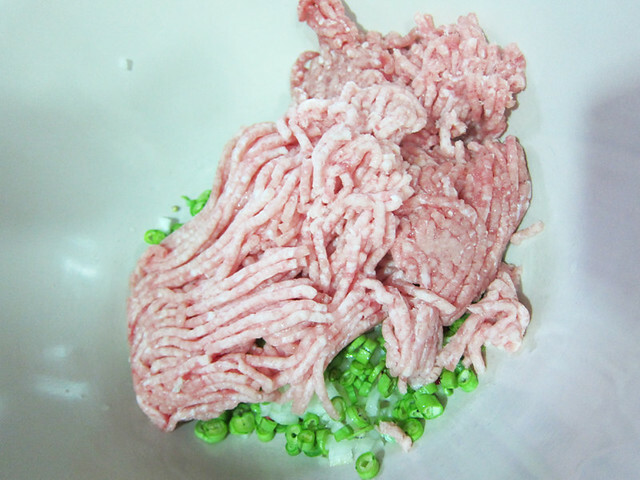 # – Followed the pork mince. # – And then the bread crumbs. 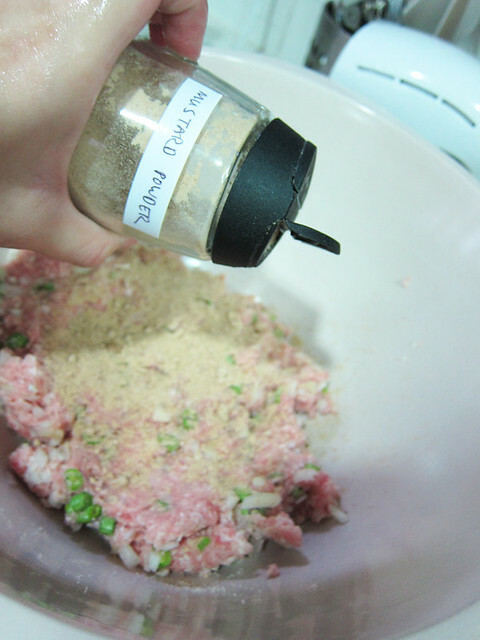 # – Sprinkle mustard powder all over. # – Don’t forget the salt as well. 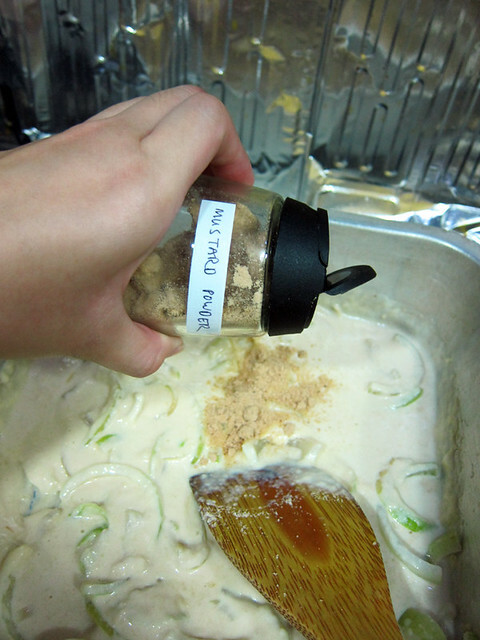 # – Using your finger, knead the mixture until everything’s combined. 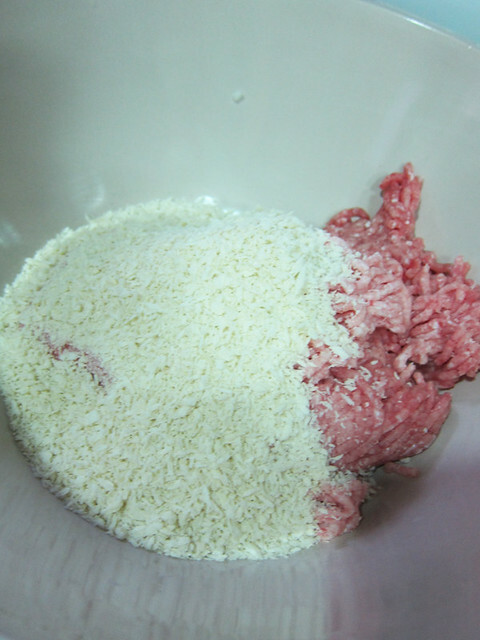 # – To form the meatball, get a clump of mince, flatten it then place a couple of cream cheese cubes in the middle. # – Then cover it up and form a ball. 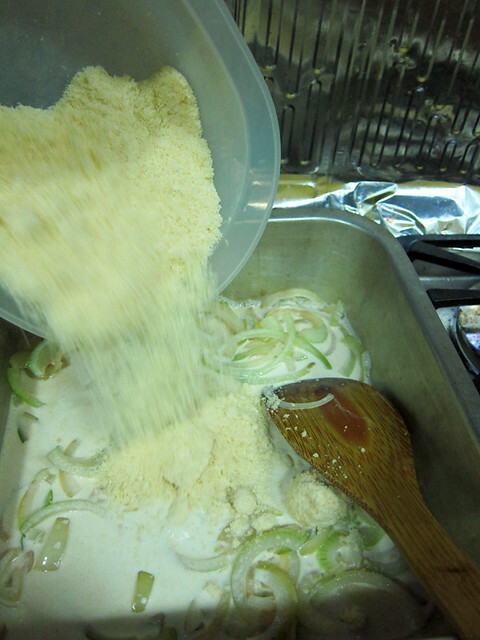 Kind of like making glutinous rice balls. 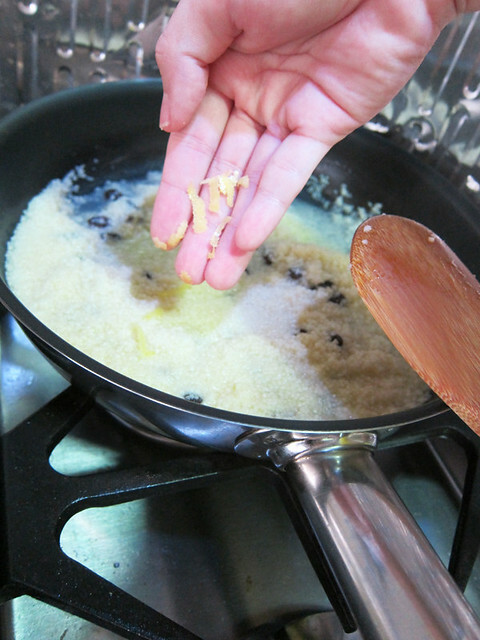 # – Heat up oil in preferably a non-stick pan, place the balls in it to brown. 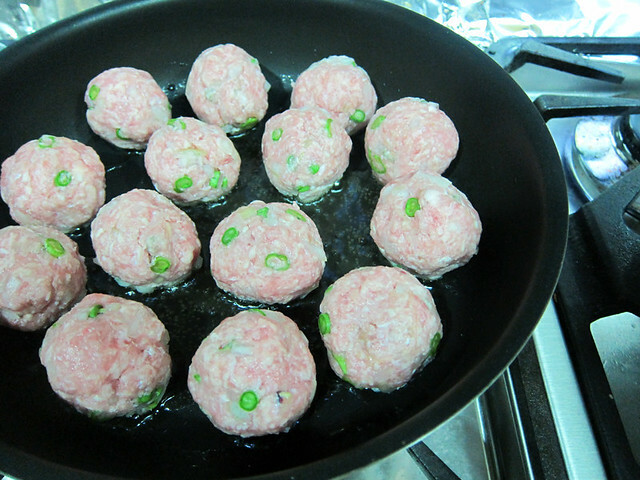 Don’t crowd the pan so that the balls will cook evenly. 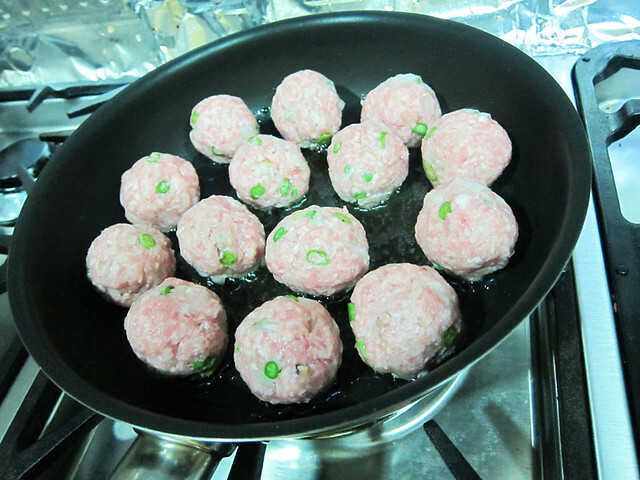 # – After a few minutes, turn the balls around to cook the other side. 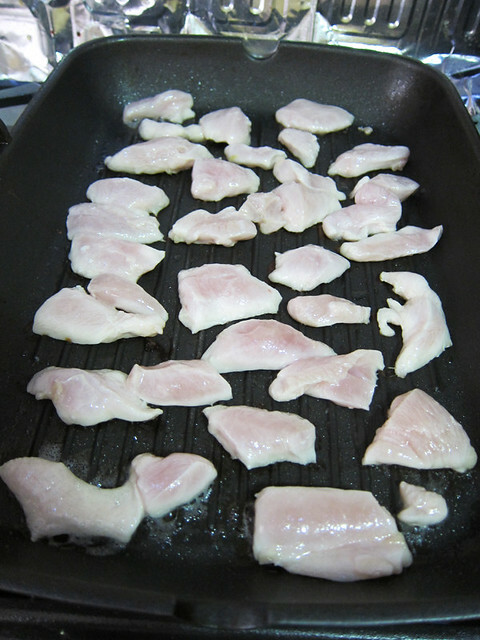 Turn them occasionally so that all sides are browned evenly. After all the meatballs are browned, set aside. 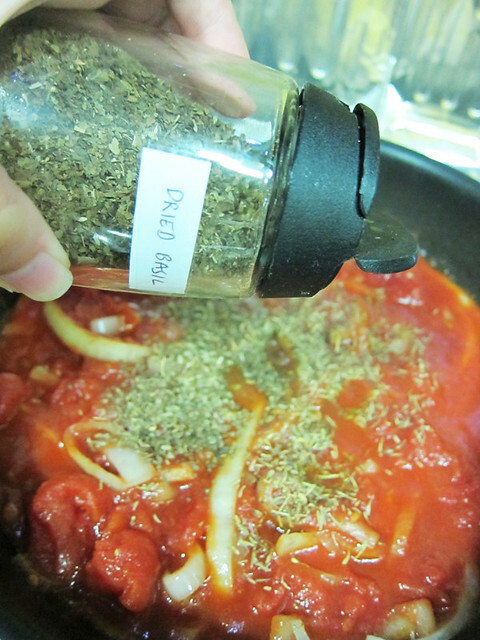 # – Now, to make the tomato sauce. 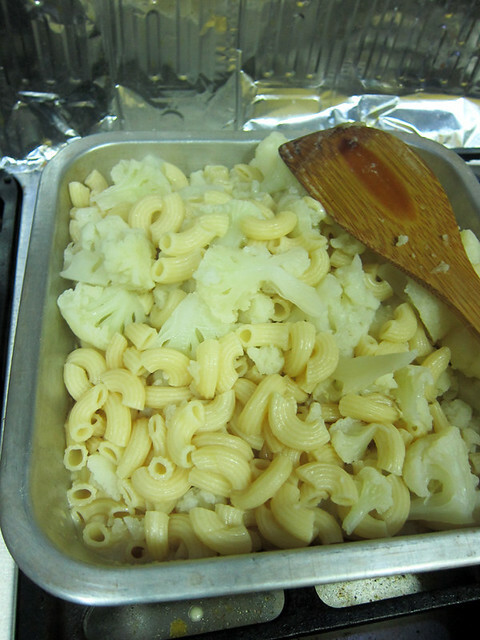 In another pan, brown some onions and then dump in two cans of plum tomatoes. Cut the tomatoes if they’re not already cut. 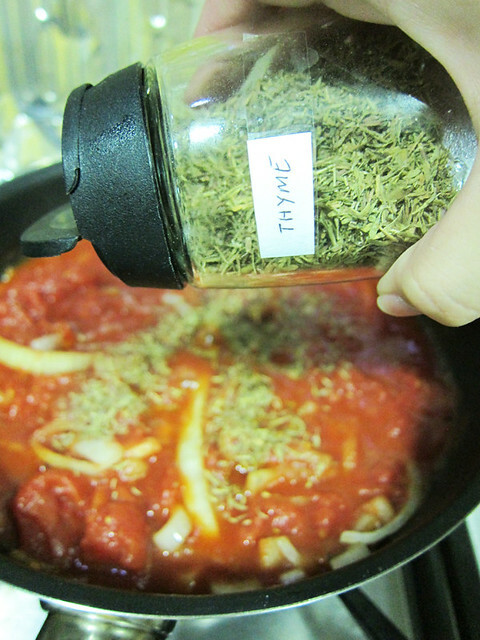 Throw in the thyme. # – Stir in the sugar to offset the tang. 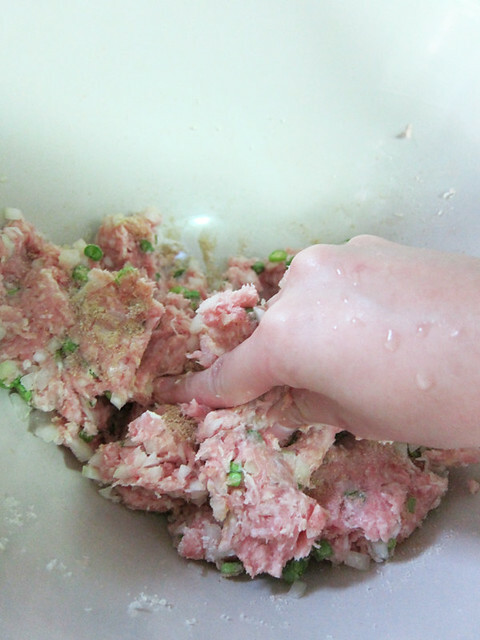 # – Then, dump in all the meatballs to simmer for a further 10 minutes. Make sure all the balls are evenly coated by the tomato sauce. 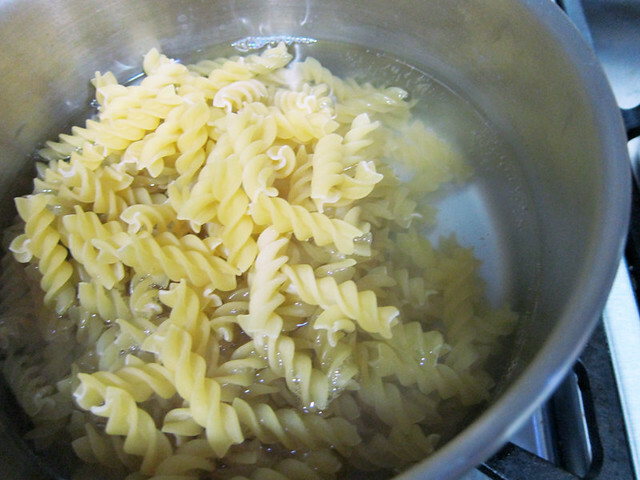 # – In the meantime, cook 300 grams of pasta according to the instructions on packet. 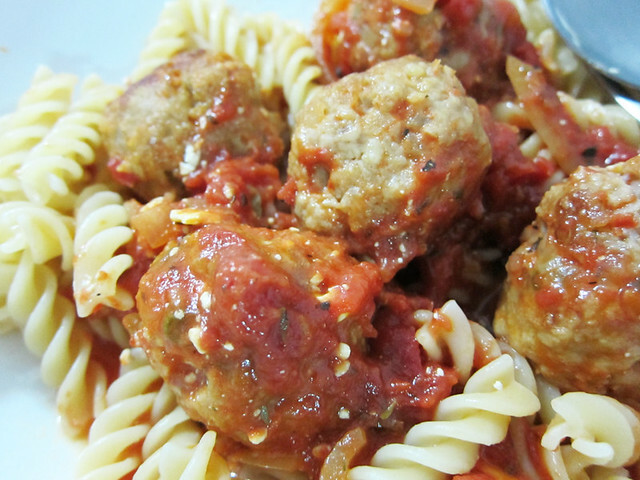 # – When pasta’s done, drain it, serve on a plate and pour the tomato sauce and meatballs over it. 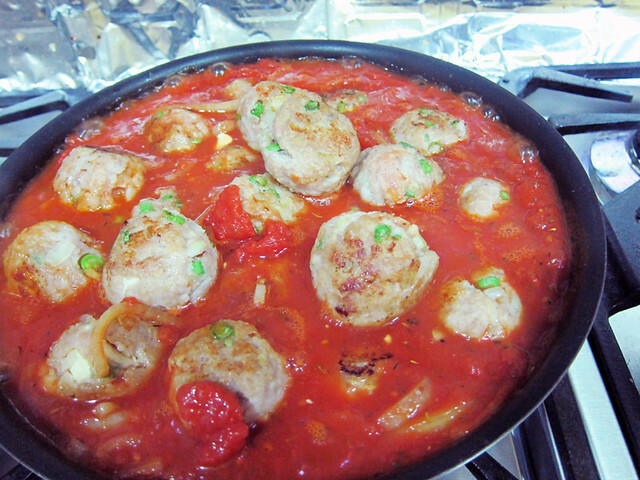 Stuffed pork meatballs pasta, DONE! This recipe serves 4. 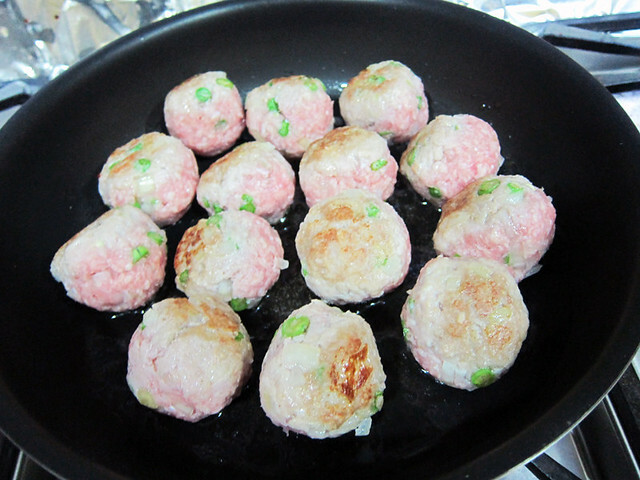 I think this was my better attempt with pork meatballs (compared to my first experience) because the balls really held their shapes. I don’t know why…but I had always thought couscous was a nightmare to cook. Never mind I had never cooked it before. Maybe it’s because good couscous can be so amazingly fluffy and light….which got me to assume that it’d take a lot of skills to produce good couscous. How wrong was I! Recently, I bought a packet of couscous just cause it was on sale and I’m so glad I did because I finally found out that cooking couscous is easy. 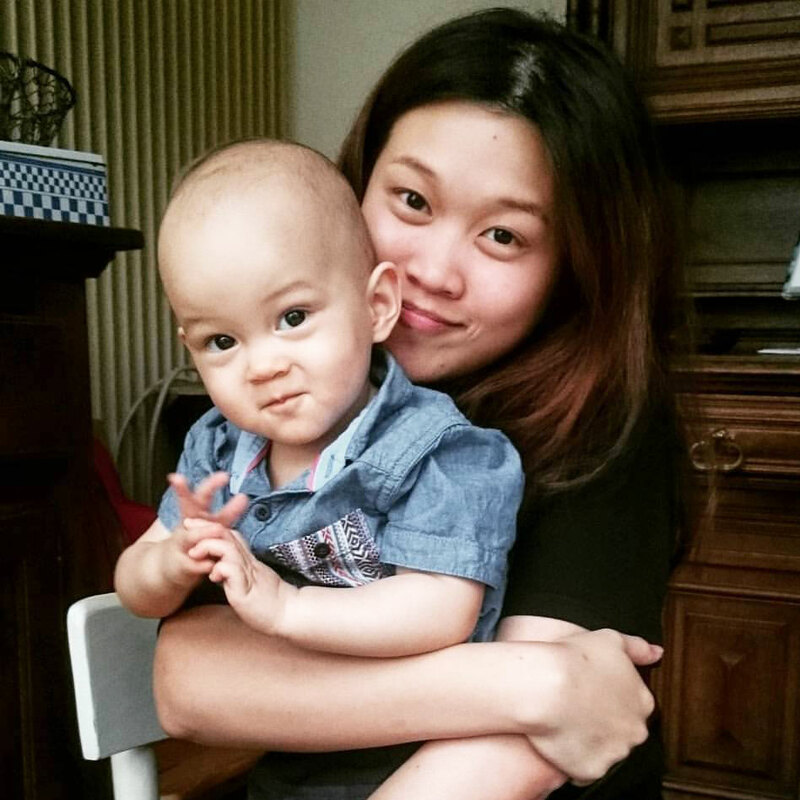 In fact, it seems even easier than cooking rice or pasta! 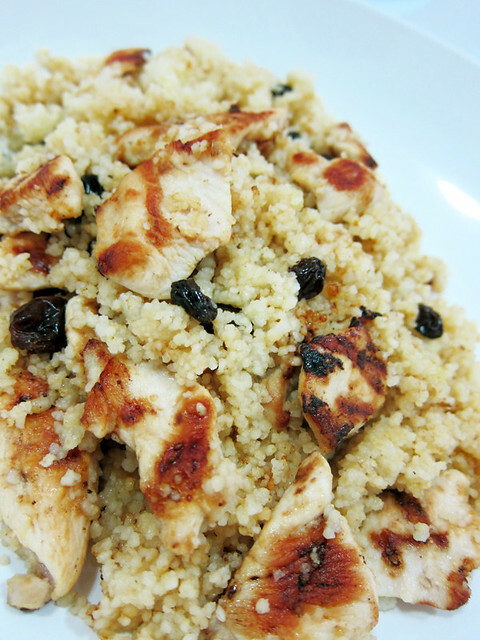 # – Delicious lemon chicken couscous. Don’t believe me? Read on…. 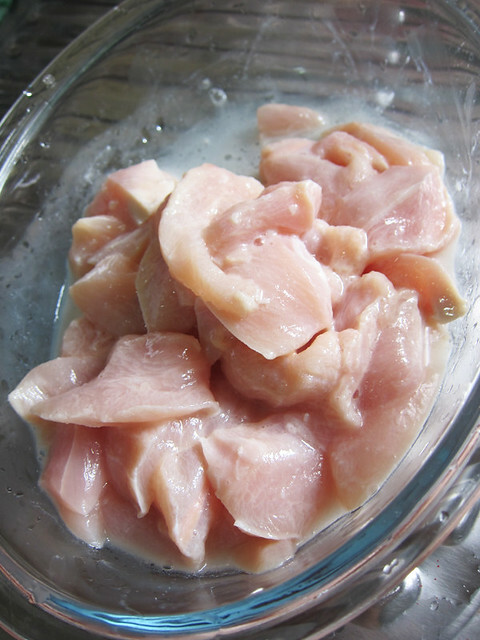 # – First, marinade the chicken in lemon juice, salt, cooking oil and some cornflour for 30 minutes. 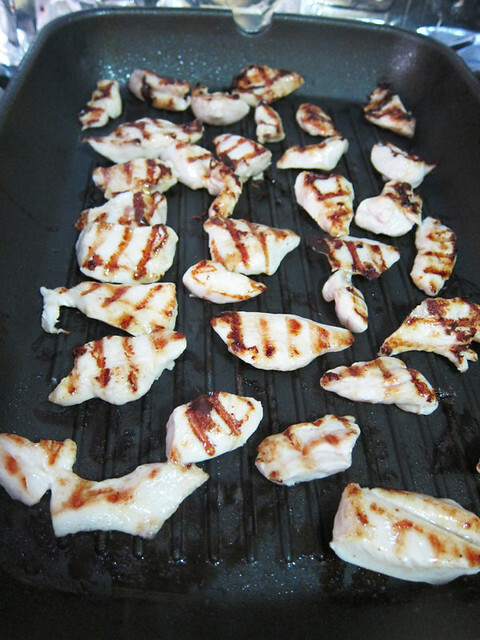 # – Then, heat up a well greased griddle and lay all the marinaded chicken meat on it for a few minutes. # – Turn to cook the other side. Also for a few minutes. Remove from heat and set aside. # – Boil the water in a pan. 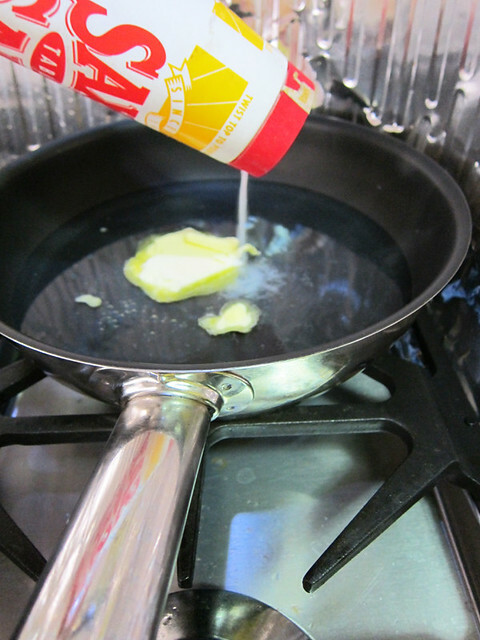 Add in butter and the salt. 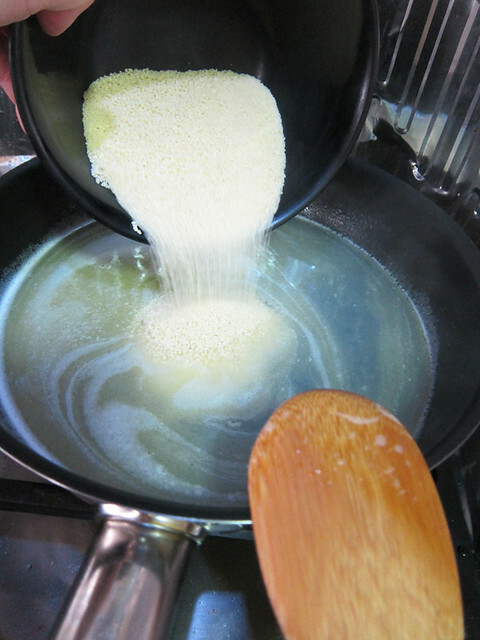 # – When water has started bubbling, turn off the heat and pour the couscous in. # – Also chuck in the handful of raisins. # – As well as the lemon zest. 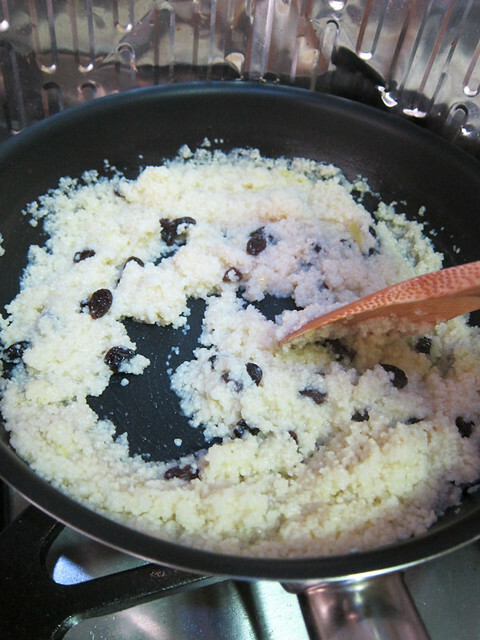 # – Now turn on the lowest heat and gently stir the couscous till it’s not longer wet and the couscous seem fluffy. # – At this point, add in the grilled chicken made earlier. Mix them up nicely. 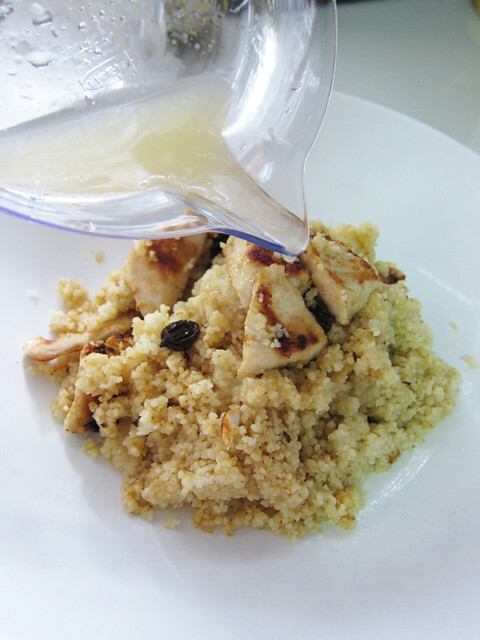 # – Before serving, pour some lemon juice all over the couscous. 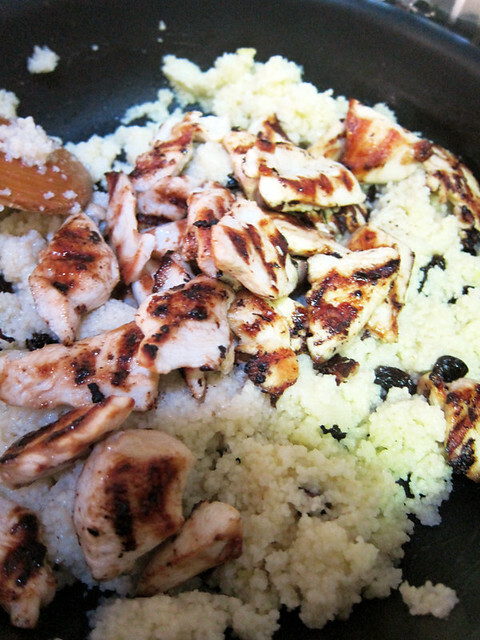 # – Lemon chicken couscous, DONE! The couscous was fluffy and light with a nice lemony tang to it, made interesting by the burst of sweetness from the raisins. The meat was tender and deliciously flavoured by the lemon marinade…making this dish a real winner. 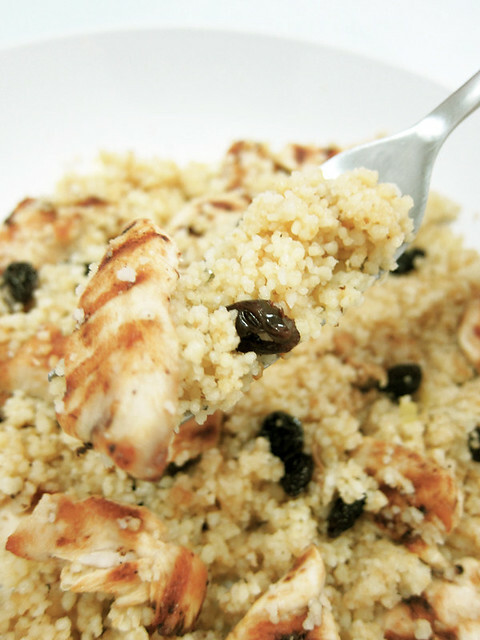 Since we’re here, do you know that couscous is also a healthier alternative to pasta or rice? According to Wiki, it has a superior vitamin profile to pasta, containing twice as much riboflavin, niacin, vitamin B6, and folate, and containing four times as much thiamine and pantothenic acid! I don’t even know what pantothenic acid does but hey, hook me up! The BF has been bugging me to make him cauliflower cheese for the longest time. He grew up eating them and it’s one of his favourite comfort foods. I don’t know why I haven’t gotten around to making it. I guess I was intimidated by the vegetable? I’ve never cleaned and prepared cauliflower before. And it’s white. That’s just abnormal. Vegetable is supposed to be green or at least in darker shades of colours. White is creepy. 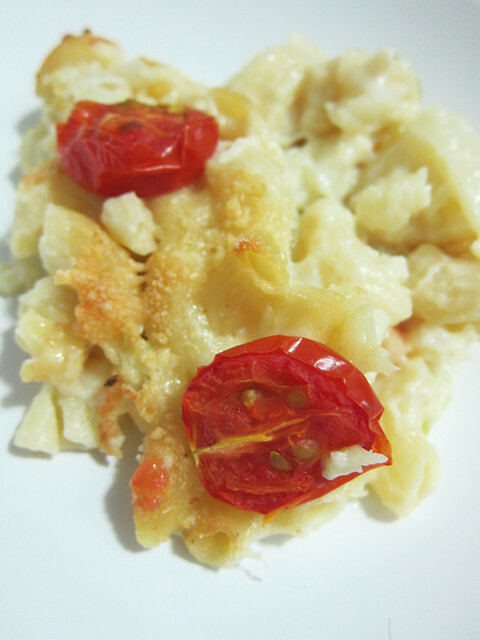 # – Cauliflower macaroni cheese. 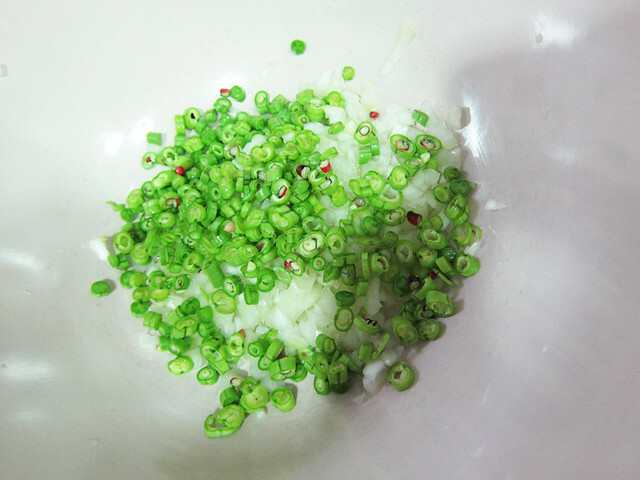 # – Prepare a deep pot of boiling water seasoned with salt. Throw in the cauliflowers. They take about 8-10 minutes to cook through. Depending on how long your pasta takes to cook, chuck them in at the appropriate time too so they cook together with the cauliflower. 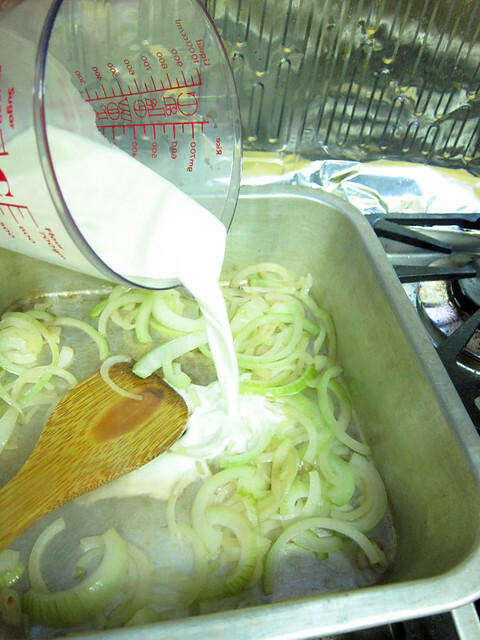 # – Put your baking tray or heatproof dish over the stove, heat up a bit of oil and throw in the sliced onions to brown. # – Pour in the milk. 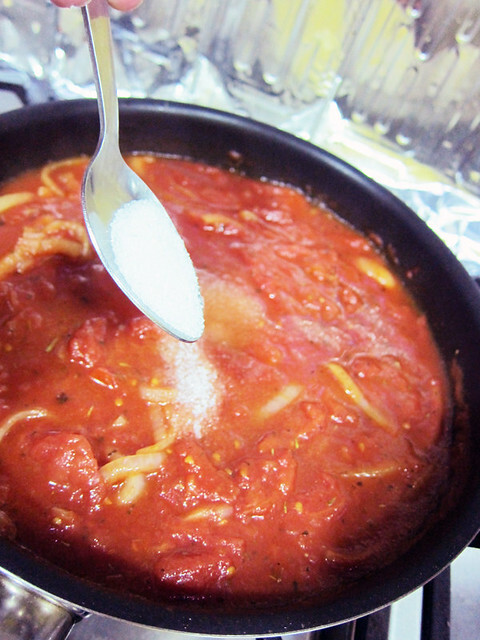 # – Then the grated parmesan. 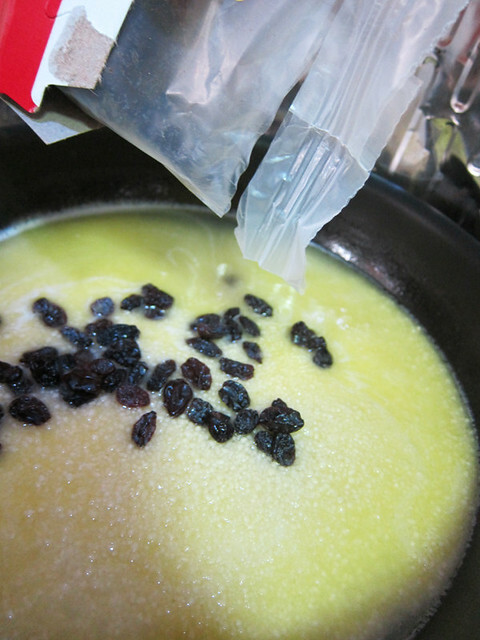 Stir till mixture’s combined. 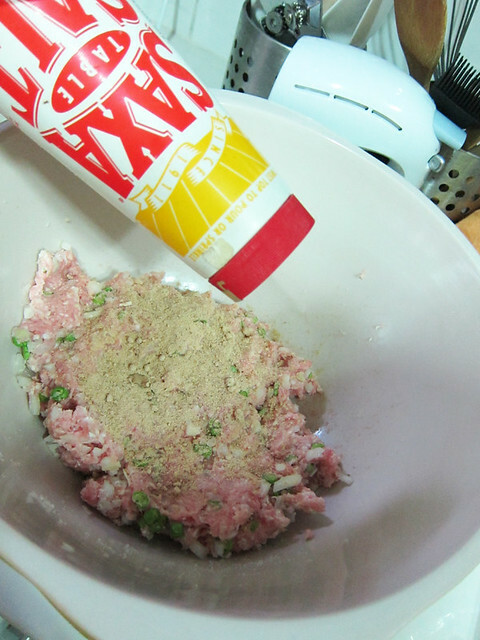 # – Next, put 3 tablespoons of mustard powder. Stir. 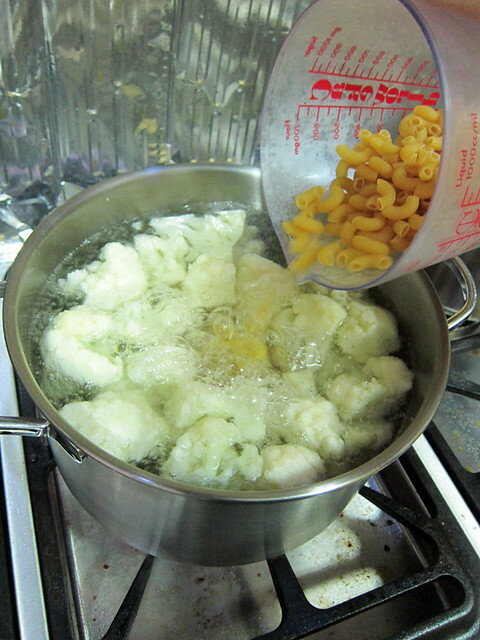 # – Followed by the drained cauliflower and macaroni. 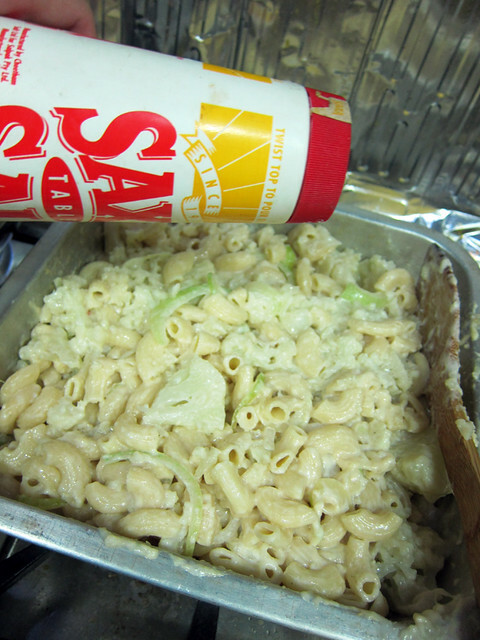 # – Give it a generous sprinkling of salt and pepper (Actually you can season the cheese sauce first before adding in the cauliflower/pasta but I forgot :P). Stir. 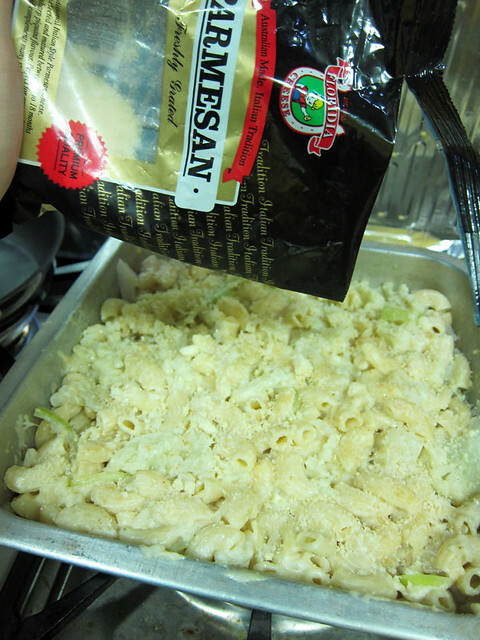 # – Sprinkle more grated parmesan all over the top. 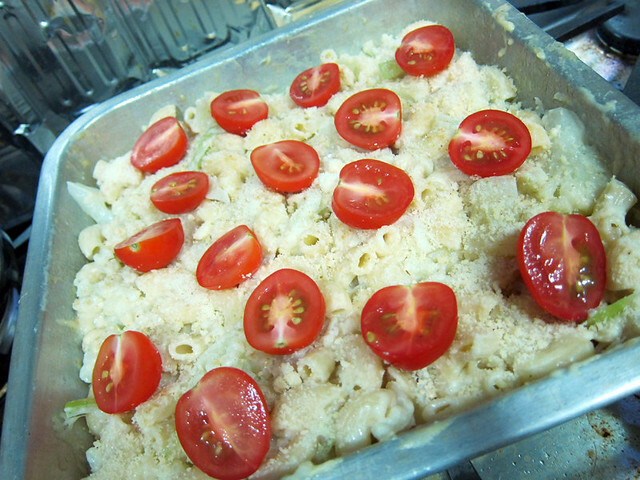 # – Place the halved cherry tomatoes all over the top. 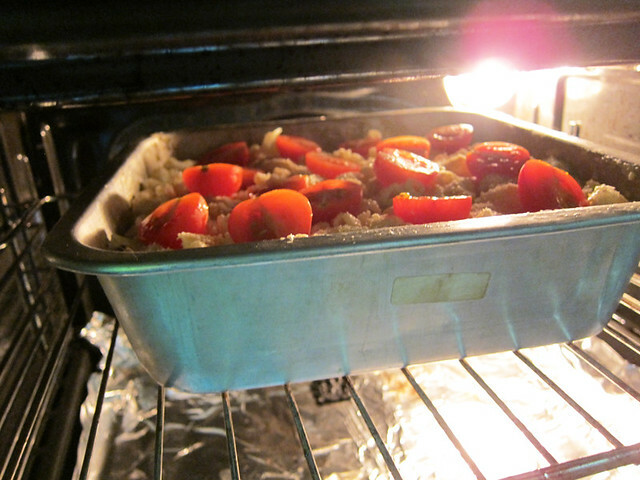 # – Stick it in the oven, on a top rack to grill at 210 degree celcius for 10 minutes or till the top is browned. 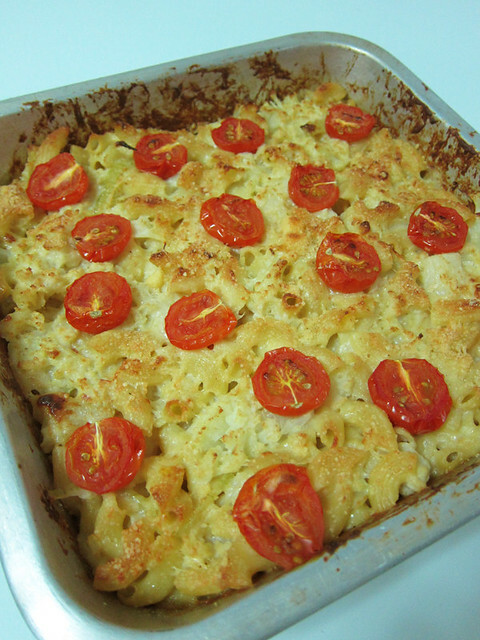 # – Cauliflower macaroni cheese, DONE! Cheesy, creamy and soft but most importantly, easy to whip up. The ultimate comfort food! I guess you can say it’s quite healthy too as there’s no meat involved. But who am I kidding? Something that tastes this good CAN’T be healthy, hahaha.